I have often put mango in my fresh pico de gallo to change it up. I have often thought of different ways to add fruit to all of my salsas to spice them up, if you will. But Thursday after a day of baking, I was eyeing my peaches. I could smell them from across the kitchen, and it dawned on me, salsa! I was going to be making chicken tacos, and Mexican rice, with pico de gallo, but add peaches? YES! It was quite tasty if I may say so myself. It gave a sweetness you cannot get from the tomatoes, even from your own garden. I can’t explain it much more than that, just trust me and try it. I tried telling my mama about it and I couldn’t find the words, they failed me. So I said the same thing to her, you just have to trust me and try it, it is really good! Oh just do it, you won’t be sorry. 1. 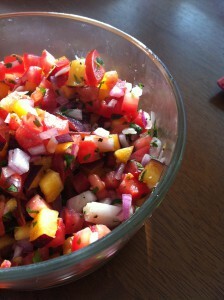 Chop the tomato, peach, onion, chile Serrano, and cilantro. Try to keep them about the same size, except the cilantro, that would be hard. It makes each bite that much so much better. 2. Add salt, pepper, and lime. Combine well. Eat with tortilla chips, tacos, over baked chicken, topped on a burger, or as a salad dressing. The possibilities of this pico are endless.